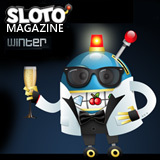 If you're registered at Sloto’Cash Casino, the winter issue of your free Sloto Magazine is in the mail this week! As usual, it's full of bonus news, casino tips and strategies, contests and comics. Free player magazine has tips and strategies for online casino players. Many players go straight to the magazine's Bonus Calendar and Coupons pages. But there are also lots of interesting articles to help us enjoy our casino time more, like Strategy for Winning Face Up 21 Blackjack. Other feature articles explain what casino cashback offers really mean to players and how slots tournaments work. (There’s also a Winter Slots Tournaments Calendar in the magazine.) All Ways Pay is a feature on many new games so there’s an article explaining the benefits of that as well. For the holidays, there's a Christmas word puzzle and a review of a Naughty or Nice, one of the most popular Christmas slot games ever. In his comic this month, Mr. Sloto greets the New Year with his favorite slots characters. Sloto’Cash Casino players that have made deposits that quarter receive its free Sloto Magazine by mail. You can register at slotocash.im to receive the next quarterly issue.